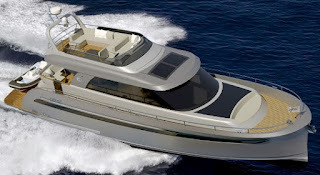 Steeler have received a fully custom order from a long-time fiberglass owner to build his first aluminium motor yacht. For Steeler this means the opportunity to enter the world of speed and performance, which for this project will be combined with efficient fuel consumption, resulting from the lightweight aluminium construction and the benefits of the patented S-line design. This project which from rendering will be called the NG63 S will be powered by twin 1200hp Man engines. This project NG63 S will based on the hull from the NG57 and will feature a stretched wheelhouse, a flybridge in combination with a sliding roof over the wheelhouse and an extended hull length to over eighteen meters to create exactly the amount of deck and cockpit space required by the owner. Princess launch the new 62 for its Flybridge range. The all-new 62 encapsulates the Plymouth based shipyard's design and benefits of the latest infusion technology, enabling the inclusion of features normally possible only on much larger craft. The silhouette of the 62 is unmistakably Princess, from the vast sweeping deck saloon windows to the clean lines of the canopy. New sculpted hull side windows, which are distinctive yet understated, give the exterior a dynamic appearance. Her hull form allows greater efficiency and fitted with twin Caterpillar 1000hp engines the 62 is anticipated to reach speeds up to 34 knots. The Princess 62's flybridge inspires relaxation with a large dining area, a sun-pad aft and a unique circular forward seating area that can be converted into an additional sun-pad. Inside the 62 offers a spacious main deck saloon with an astern galley arrangement that opens to the cockpit. The helm position is located to starboard with additional forward facing guest seating opposite. Below deck six guests enjoy three beautifully appointed en suite cabins all bathed in natural light from the elegant hull glazing, with the option of a further twin cabin aft for occasional guests or crew. The 62 features the latest evolution of the signature Princess Design Studio styling. Elegant shaped surfaces and precision layered geometry define the interior to form a truly tranquil environment with meticulous attention to detail. Bespoke furnishings including a handcrafted coffee table in the main deck saloon which beautifully blends the color and textures of timber, glass and leather, combine with soft suede, bronze tint mirrors, hand stitched detailing and Japanese wallpapers to create perfect harmony. Sealine now since some years owned by the German Hanse Group continue to move forward and show a newly developed C430 project. A latest development in Sealine range, the new C430 follows the recently presented C530 in a smaller package. As every Sealine, the C430 offers a considerable amount of space for its size and follows current trends of a fully enclosed hard top sport cruiser with a living and astern galley all on the main deck, and lower area dedicated for the cabins. Here the buyer of a C430 comes with four choices from two large suites and or a three double cabin choice. The Sealine will be powered by standard rather small for thirteen tons plus of displacement just doing it twin Volvo 300hp with IPS pods propulsion, which give an estimated 25 knots max speed. Optional engines are for Volvo 370hp and or 435hp units also with IPS pod drives, this largest option giving a top speed of 33 knots. Cranchi present the new 60 ST which is an update version for the Fifty 6 Soft Top launched in the fall of 2010. 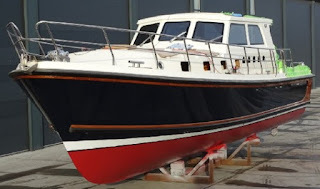 The main distinction of the two models is the everybody wants it traditionalist do not like it large hull side windows now found on the new 60 ST. But Cranchi also added one hundred liters of fuel capacity in the new 60 ST now 2100 from 2000 and also updated engine choices with the latest Volvo 625hp and 725hp coupled to forward facing IPS pod drives. The 60 ST keeps the good stuff of the 56 ST that for having a large open but still protected cockpit deck. Bavaria E34 Sedan is the next step in the evolution of the E-Line. Covering a length of ten meters, the E34 offers two fully-fledged twin cabins, two bathrooms and a large saloon with a unique all around panoramic view. In the center of the saloon is the central helm stand from which one does not only have a perfect overview of the yacht but is also in the center of the action. In front of the helm stand is the large pantry and the long saloon table. Behind the helm is the large cockpit and a fold-able bathing platform. For those who would really like to relax, there is a large sun-pad on the bow. The two cabins are generously laid out with their own bathrooms. Future owners can choose between a separate shower or an additional large storage space in the bow. The Bavaria E34 offers aft a complete small suite. For the E34 Bavaria will offer single engine power choices which start from 60hp, and have 110 and 220hp optional choices. The Bavaria E34 is also available with the environmentally-friendly Diesel-Electric-Hybriddrive as an option. 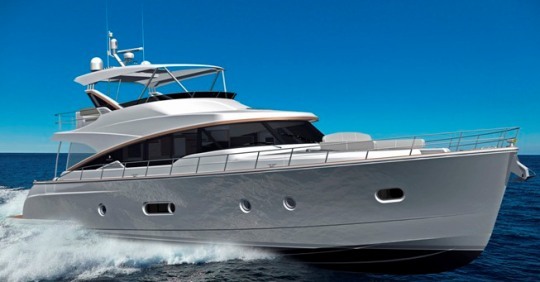 An E 34 Fly flybridge version is also available. The Pershing 74 is a recent success and now for 2017 it too has been given a substantial improvement which mostly concerns the interior decor. The new key features are the updated shades and the new Alpi wood and lacquer details, which provide a common thread running through the different rooms, appearing in everything from curtains to mirror frames and bathroom cabinets. The sophisticated finishes and fine details can be seen in the lounge, furnished with a large, L-shaped corner sofa towards the stern, a central table with a smooth leather top and a structural unit with a retractable flat screen TV. Ceilings and bulwarks are covered with Poltrona Frau leather in a light shade especially created to finish these decorative features. The leather on the helm station and seating is also made by Poltrona Frau. It marvelously complements the other finishes and the white oak flooring. The galley is mid-level between the main deck and below deck. The units are coated with white gloss lacquer and once again there is a contrasting effect thanks to the dark Corian top. The lower deck magnificently blends natural light with Led lighting, creating appealing effects that really bring out the ivory and dark grey hues of the interiors. In the full beam master suite, the paneling covered with Vescom wallpaper is masterfully broken up by “strips” of Led lighting. Two burnished mirrors make the space feel bigger and there is a king-size bed upholstered with Poltrona Frau leather, as well as two Artemide wall lights. Rounding off the furniture is a chaise lounge with textile upholstery by Zimmer + Rohde. The style of the master suite is reproduced in both the fore VIP suite and the guest cabin, which comes with two parallel beds and can be fitted with a pull-man bed on request. They are all adorned with the same dark grey lacquer detailing, ceiling coverings, ice-colored bulwarks and Poltrona Frau leather upholstery. There are ivory carpets in all of the cabins. The basins in the bathrooms are made by Brera and the mixer taps by Ritmonio. The Pershing 74 is equipped with twin MTU 1948hp which give a top speed of 44 knots and a cruising speed of 40 knots, while offering maximum comfort with the trim at all times. When Lynx launched One in 2014 it was different to everything else on the market, and since then we are seeing more support inspired yachts launched at even bigger sizes. Super yachts have grown to major dimensions today, and so bigger support vessels which also enter over the 24 meter size are starting to be build. The YXT 24 is the following of One, from a one-off it became an off the shelf custom model for the Dutch yacht builder who is rising to prominence with this series. 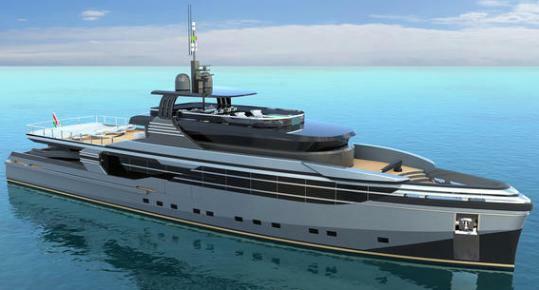 Italian Savona super yacht specialist Eurocraft has revealed details for a new 45 M concept, coming from a design in collaboration with Federico Fiorentino from Milan. For the 45 M Fiorentino offers a modern radical and contemporary style, and a research for maximum comfort during long periods at sea which equals a total reliability and efficiency. The Eurocraft 45m offers many key features such as an aft helipad, sundeck spa pool and plentiful tender storage on the aft deck. Its interior layout will offer a six double cabins owner and guests layout. Delivery times for the 45 M is between 24 and 30 months from contract signing. 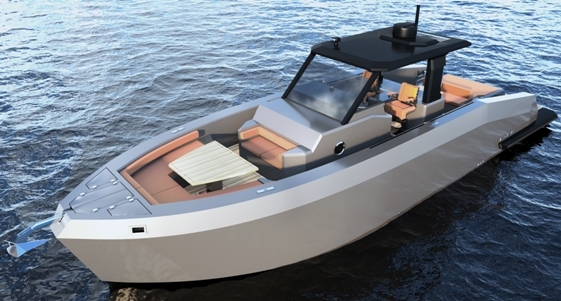 Airon Marine return to its roots with the new Amx 28 model. Having in the past decades build a reputation with its family cruisers line which today starts with the 325 model and goes up to the still in project 5400. 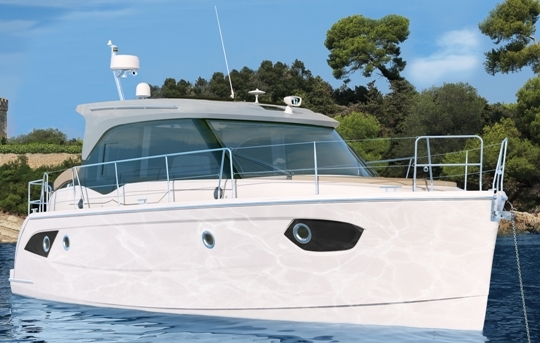 The Amx 28 is a cuddy cabin cruiser sleeping two and offering a total of three layout options. An important choice is that for an an open or closed head. Power options are varied and start from a single diesel 200hp up to twin 225hp petrol gas choices. Bering present the 105 project, which would be a flagship for the Coastal Series range. The Bering 105 Coastal Series will feature a wave piercing semi displacement hull, with a steel construction and a super structure made of aluminium. Power will come from a rather modest twin Cummins 400hp engines, with Bering estimating a top speed of 14 knots and a cruise of ten, and a range of 3500 nautical miles. Her accommodation plan will offer a four double cabins arrangement sleeping eight with VIP and owners stateroom located parallel at midships. Crew accommodation is for four persons in two cabins. Hatteras present an interesting new option which adds the advantage of an express-style fishing boat combined with the added fishability of a flybridge helm. 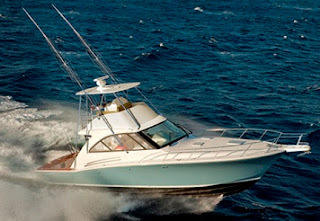 That is what the new Hatteras 45 Express with bridge option offers. Hatteras research and design team kept the original boat's proven hull form, large cockpit and generous interior, and added a flybridge with fully equipped upper helm, two chairs and lounge seating. 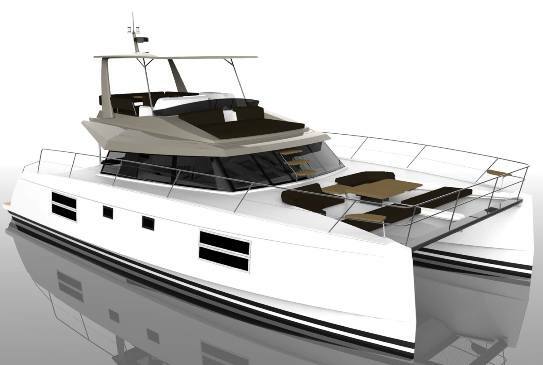 Dutch builder North-Line has launched its new 50 model. 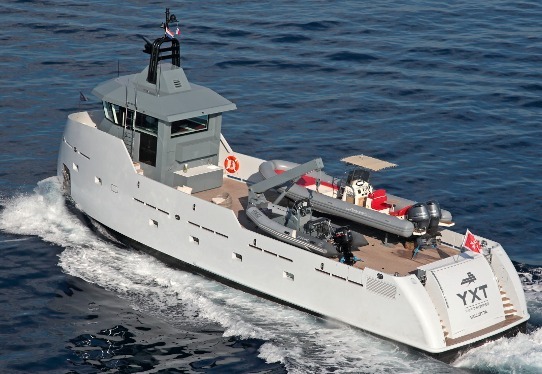 A new flagship designed by Arthur Mursell from the UK famous for the design made for the Nelson line of working pilot boats, for which this 50 and all the North-Line is inspired to. As the looks say, and the name and curriculum of the designer the North-Line 50 is a sea worthy yacht with a semi displacement hull. But to be fair to both the designer and the builder, the North-Line 50 offers an interesting accommodation plan; three double cabins with two shower heads below deck, and interesting main deck arrangement. Power wise the North-Line 50 is offered with different options subject to a buyers use and start from twin 370hp up to 900hp engines. The concept and engineering phases have been completed, and now the development of the Nautitech 47 Power is entering a new phase, with completion scheduled for the beginning of 2018. The clear lines and dynamic design of the 47 Power reveal a powerful elegance of this catamaran. The 47 Power will also offer plenty of room for luxury and relaxation, a typical virtue of catamarans due to the wider beam they offer. The stern of the Nautitech 47 Power has multiple uses with a lifting platform between the hulls that can be used as a tender-lift or as a bathing platform. 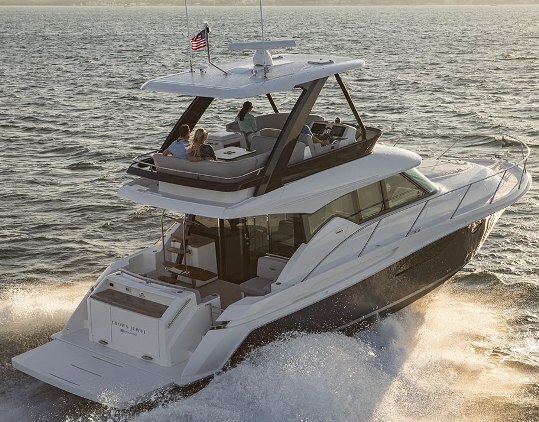 The 47 Power will offer a generous flybridge offered with a bimini or a hardtop protection, and will also features a barbecue and wet bar. The large dinette area is offered on the long table in the large cockpit with direct access to the saloon. With this clever layout, cockpit and saloon join into one living space. The perfectly equipped pantry, the exclusive lounge area in the saloon and the generous cockpit all give the impression of a penthouse apartment. 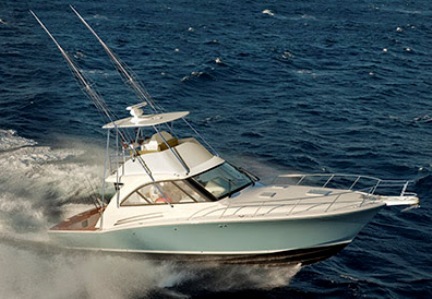 Power for the Nautitech 47 Power is by two Volvo 225hp or optional 300hp units. Max speeds are 22 knots, most interesting is that a cruise of nine knots will offer a range of one thousand nautical miles. Cruisers Cantius range has been a non stopping expansion, and have in recent years provided a good alternative for a US made European inspired sport cruiser or yacht to buyers. The new 50 Cantius launched in early February during the Miami boat show follows the exterior looks of the well recievied 60 and 54 models as done by Belgian designer Facheris. The 50 Cantius also follows a similar layout to the bigger models inside, with a main deck all dedicated to a living area, and below decks reserved for three double cabins; owners at midships, double berth to fore, and a twin bunk berth cabin to starboard. Fair to advise that the main deck is characterized by modern features which include an astern galley, full opening patio doors, lounging L-shaped settee, and C-shaped dinette. Power for the 50 Cantius comes from twin Volvo D6 435hp engines with IPS pod propulsion. 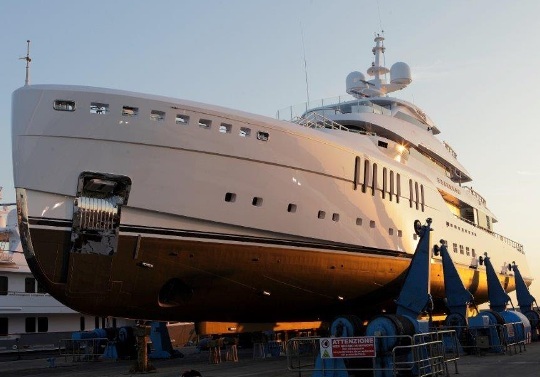 CRN, Italian Shipbuilder and brand of Ferretti Group specializing in the construction of custom steel and aluminium super yachts pleasure between forty and one hundred meters, is excited to share the first details of the Shipyard’s hull number 137. The new yacht has been engineered by CRN’s Ancona-based Technical Department, complimented by Italian firm Nuvolari Lenard, who took care of exterior concept and interior design. At 62 metres long this yacht embodies CRN’s modern approach to displacement motor yachts. Classical lines have been replaced by the unmistakable all-Italian style of Nuvolari Lenard, revealing rakish and yet harmonious lines that seem to be shaped by the wind. The bow is vertical, not to follow the current trend, but to ensure maximum length in the water, thereby increasing speed and maximizing the forward volumes, where the garage is located. CRN’s Technical Department turned Nuvolari Lenard’s concept into reality by optimizing technical spaces with no detriment to the interior layout. The aft Owner’s stateroom, opens up to the al-fresco dining area. The upper deck, which has now become the Owner's Deck, includes a forward panoramic lounge that can remain, at the discretion of the owner, private or open. CRN 137 will features five decks and includes the Owner’s stateroom and five VIP cabins, hosting up to twelve guests. It will be equipped with two MTU 2011hp engines that will push it to a maximum speed of 16 knots. Three more vessels are currently under construction at CRN: 74 m M/Y CRN 131, to be delivered during the spring and presented as an international première at the Monaco Yacht Show in September; 79 m M/Y CRN 135; and 50 m M/Y CRN 136 “Superconero”. Bruno Abbate Primatist presents its new World wide web showroom. Bruno Abbate Primatist was officially founded in 1977 but the builder is a continuation of what was started by Giuseppe Abbate in 1873 on Lake Como, and never stopped since then by the family. The founding of Bruno Abbate in 1977 also marked the switch to fiberglass for the Como family boat builder. The first Primatist was the 23, and became instantly a big success with a total production for this model of over 750 units sold in a decade plus of production. In 1995 the G range was created with the launch of the G25 followed by the G29 and G33 on the same year. The G range is a success with its best selling model being the G41 launched in 2002 and sold over one hundred units. Abbate always means racing since and after World War Two with Alfieri engineering and Giovanardi technician introducing Pamblo the first surface drive mono hull in 1947. Bruno Abbate continues the racing tradition by competing and winning with the Pinot Gancia dei Gancia the Class One European Championship in 1987, and by breaking records in the one kilometer launch with a Maserati powered boat and a speed of 216.7 km/h in 1996. Since founding Bruno Abbate Primatist new construction yards have been added, first in 1982 at Grandola e Uniti in Como and then in 2008 with the Arbatax facility in Sardinia. Another important step for the Bruno Abbate Primatist was the agreement with Poalo Pinifarina in 2004. 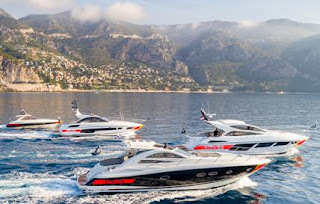 The first boat to be created from this is the current ever largest sport yacht build by Bruno Abbate the G70 Pininfarina, which is followed by the top selling G46 launched in 2007 and three other models after that. Today Bruno Abbate Primatist is managed by his son Marco and presents a range of four models; B 41 Pininfarina, G 46 Pininfarina, G 53 Pininfarina, and B 62 Pininfarina. Bruno Abbate Primatist new website takes you around with the following buttons; Story, Models, Service and Contacts. Bruno Abbate Primatist is also present on social media Facebook platform with a link located at the bottom of the page. Couple weeks ago we presented the Belize 66 Sedan project on PowerYacht, and here we are showcasing details of the Daybridge with flybridge version. The Belize 66 Daybridge layout has the choice of a fabric bimini top that covers the helm and forward lounges and a hardtop option which extends cover for almost the entire bridge space. A staircase leads up from the saloon, opening to the helm with skipper and companion chair, a wide dashboard and sports wheel. A viewing lounge is set along the starboard side and, further aft, an L-shaped lounge surrounds a timber dinette. Outdoor food preparation space to port with its large barbecue, sink and long bench top with fridge and plenty of storage under. There is even more storage available aft of the dinette. The Daybridge option on the Belize 66 comes along other choices; three or four double cabins option for the lower deck, and two main deck option with a choice of an dinette or forward facing lounge settee. It was a long time coming for the Fairline 53 Squadron, and ultimately the new model ended up being bit different to the project presented in 2015. A lot of things have changed since then at Oundle, but the most important is that the British boat builder is run by new dedicated owners nowadays, and they have a present and future plan. This new 53 Squadron is based on the 50 launched in 2012 and is one of the most versatile flybridge motor yachts ever to come from Fairline, if not from a British boat builder. Selections for the buyer are endless; two flybridge decks, four main deck, and four lower decks choices. Custom and semi custom words are very much abused words since boat building became a production entity rather then a build to order one, solely in most cases because you could choose the color of some curtains. But here we are looking at a lot of versatility to suit different owners needs. For this alone I do think the Fairline 53 Squadron is above most of its competition in the sixteen meter size, but also a step in the right direction for the British boat builder. Mazu Yachts has been designing, producing hard-top and open motor yachts since 2011 and have since then created a name for sleek and aggressive looking planing-hull cruisers and yachts built using the cold-molded system. Mazu Yachts stands out of the crowd with their special “hand-crafted build” due to their building technique, which gives the hulls extra strength and lightness. The center console is the main theme for this 42 Walk-Around project which is a modern superstructure, leaving room for two ample lateral walk-around. Halit Yukay, head designer and owner of the yard, has succeeded in giving the 42 a free board that is high enough to allow movement on deck in complete safety even while at sea, but still keeping her sportive profile with it’s military twist overtones. On-deck comfort is assured by the ample sun bathing area near the stern, while forward the cockpit is complete with a V-shaped and a second settee forward of the console. The size of the aft platform has allowed the yard to create a seaside terrace, ideal not only while at anchor but also when moored to the jetty, facilitating coming aboard and going ashore. The presence of a mobile kitchen with Gaggenau appliances ensures leisurely and pleasurable times when at anchor. The yacht’s eight ton displacement and special hull shape take full advantage of the propulsion system of twin Volvo 435hp with IPS600 pod drives giving the Mazu 42 Walk-around a top speed of 47 knots, with a cruising speed of 32 knots. Mazu 42 Walk-Around interiors are characterized by generous headroom with elegant minimalist styling featuring use of Alcantara and leather trim created by the Italian company Foglizzo. Forward the 42 Walk-around has a large queen size bed with a comfortable settee to port and a large bathroom with all the features to starboard. The last year has been a good positive patch for the nautical industry, and we are seeing important growth numbers by the major boat builders again reported for the first quarter of 2017. Europe is finally going out of the recession, but in reality this is not the main reason why we are on the positive sign. The nautical industry has its own macro economics which are different to that of the general economy. A positive economy helps but it is not just about that. A foremost reason about the positive period for new boat builders is that finally the over stock of used boats, especially those owned by banks has declined a lot in recent times. In 2016 finding a good boat owned by a bank was difficult. A boat needing little money spent to go running sell in a month or two with brokers having clients ready for these boats nowadays. Other reasons why we are having this positive patch is also because of the stability of oil prices in recent times, and that used good boats are selling at a good pace. We also have the problem where not a lot of news boats where build in the period 2010 to 2015 especially in the size of ten to thirty meters. Most boats in these sizes where build to order. 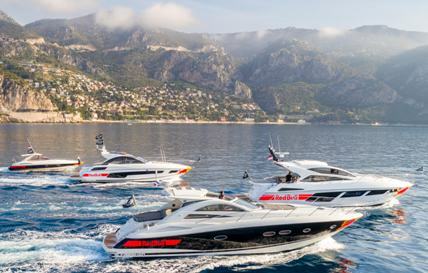 The fall of the year and major boat shows will be an indication of what the main players are feeling from the market, and how bullish are they on the current positive trends of the last one year plus. The telling signs will new models and projects presented.